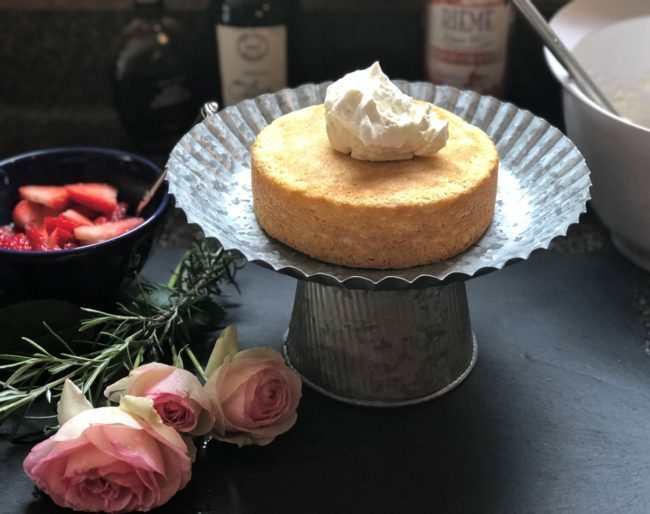 I saw this lemon olive oil cake recipe in Better Homes and Gardens in 2015, but only recently got around to making it. I love this cake! It is so cute made in the 6” round pans. Plus it’s super easy and delicious and will wow your friends and relatives. However, as I made the cake, I realized that it’s not a cake that can travel as the whipped cream frosting melts pretty quickly. It was warm the day I baked it and when I took it outside to photograph I had to keep returning it to the refrigerator so the Lemon Cream would remain set up. 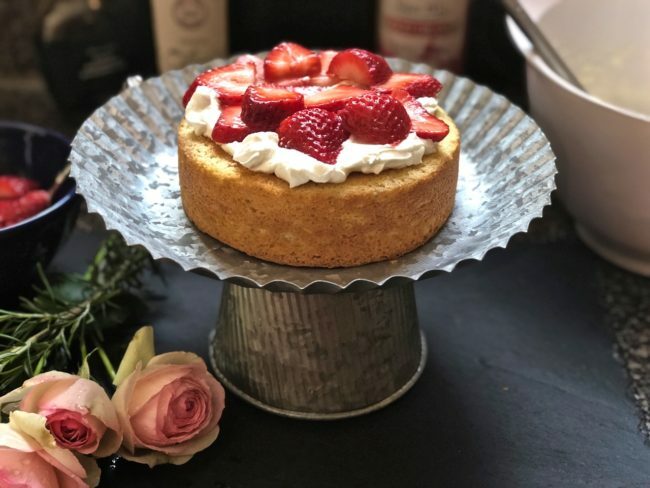 It pretty much needs to be made and eaten the same day as the whipped cream frosting gets a funny texture overnight. Tastes ok … just kind of shiny. After my first effort, I decided to try a different frosting that allows the cake to travel and still be delicious the next day. 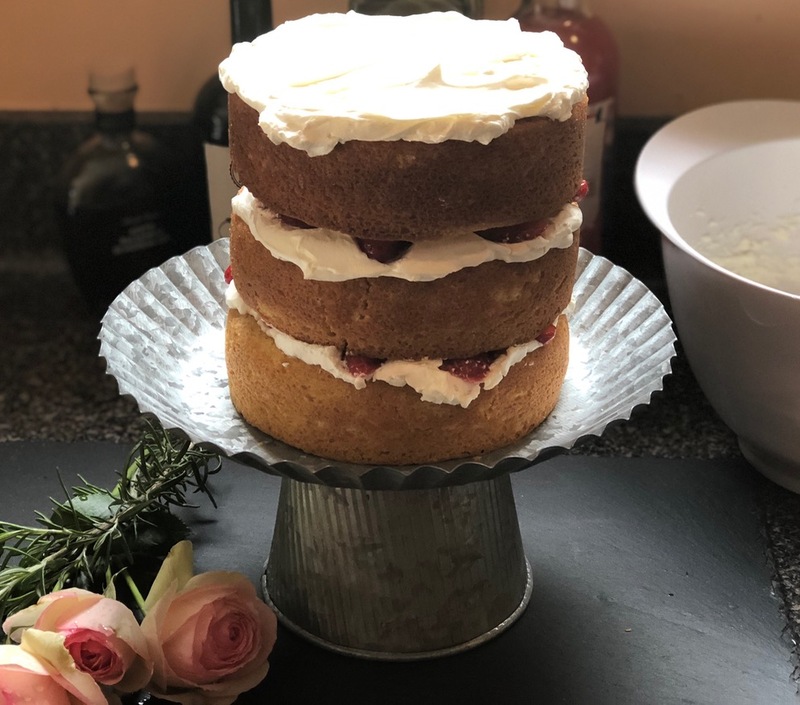 However, it is still best to assemble and serve the same day as naked cakes tend to dry out quicker as there is less (or no) frosting on the sides to seal in the moisture. 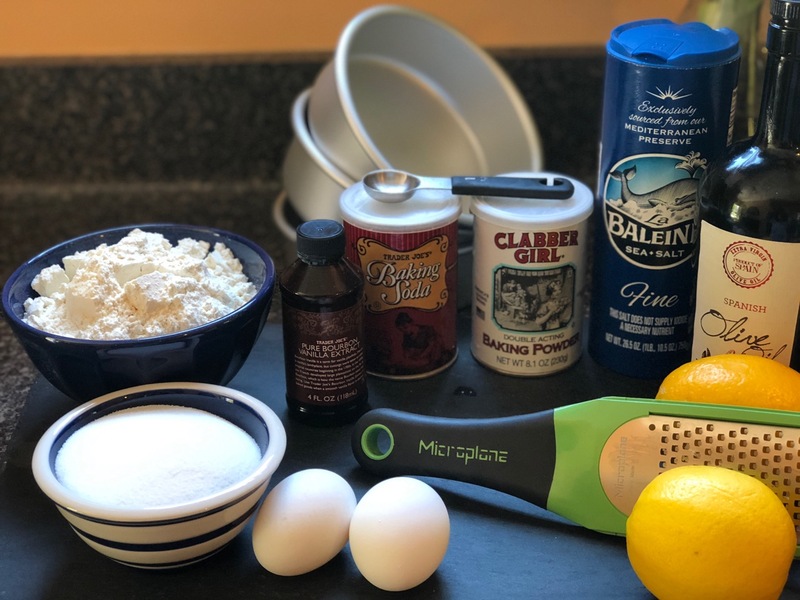 The mascarpone frosting is easy and makes plenty of frosting so there will be some left over (scones or crepes anyone?). 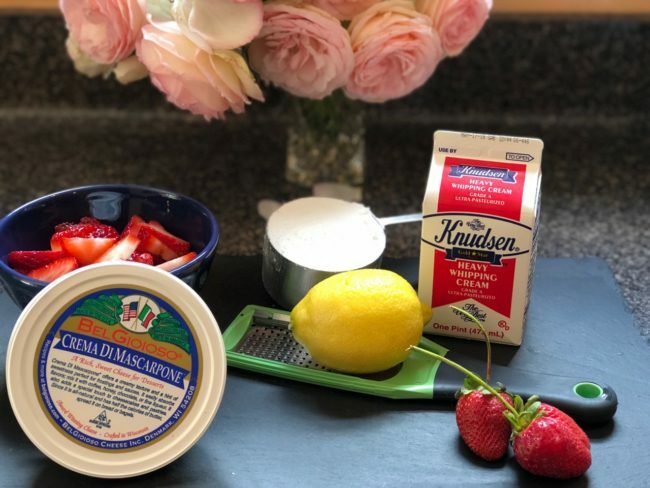 Mascarpone is an Italian cream cheese which is very creamy and spreadable … add a little sugar, cream, some lemon zest, and voila! After I shared the photo with a friend, I learned that “naked” crumb cakes are all the rage for this year’s brides. Basically, you lightly frost the cake and then scrape it off (I wonder if that saves you any money? 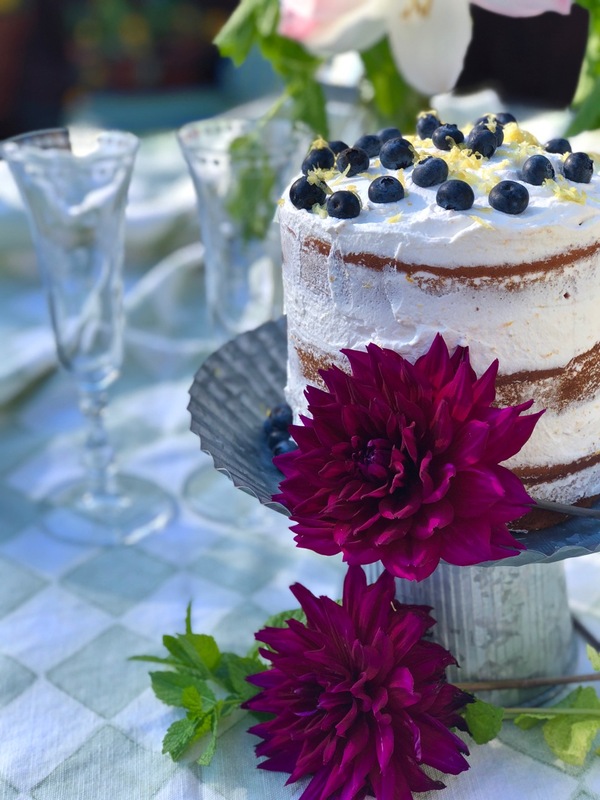 … Wedding cakes are expensive!). This method allows the cake and any filling to be the star, oh, and you, too, for making such a tasty cake! 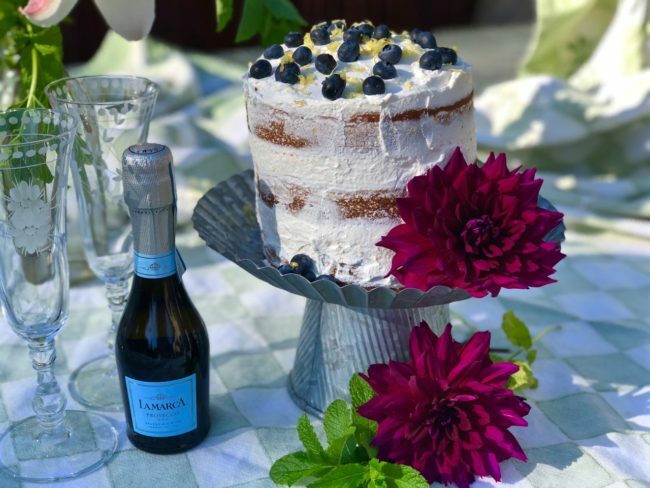 I topped the first cake I made with blueberries and lemon zest. The second time I made it with a layer of Grand Marnier marinated strawberries … YUM … fruit or no fruit this is a really tasty olive oil cake and did I mention, it is CUTE! 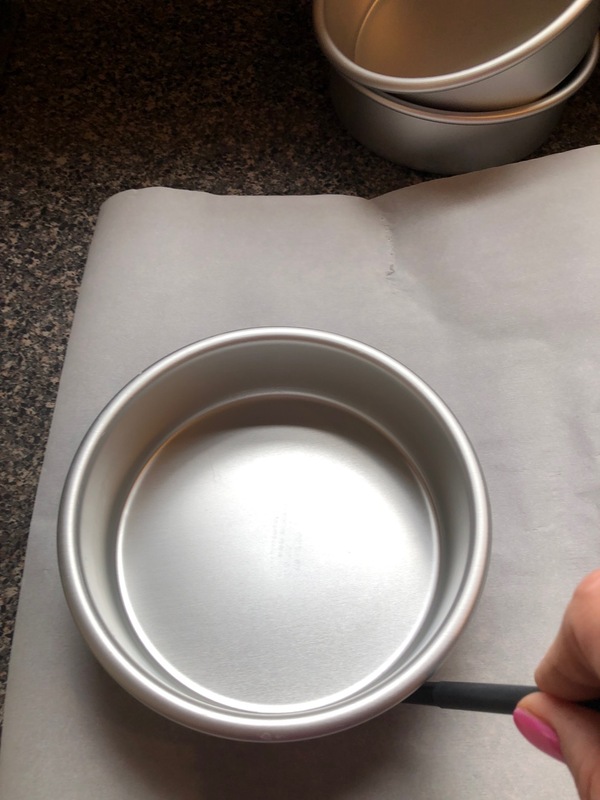 Line your round pans with parchment paper so the cake will come out of the pan without sticking. 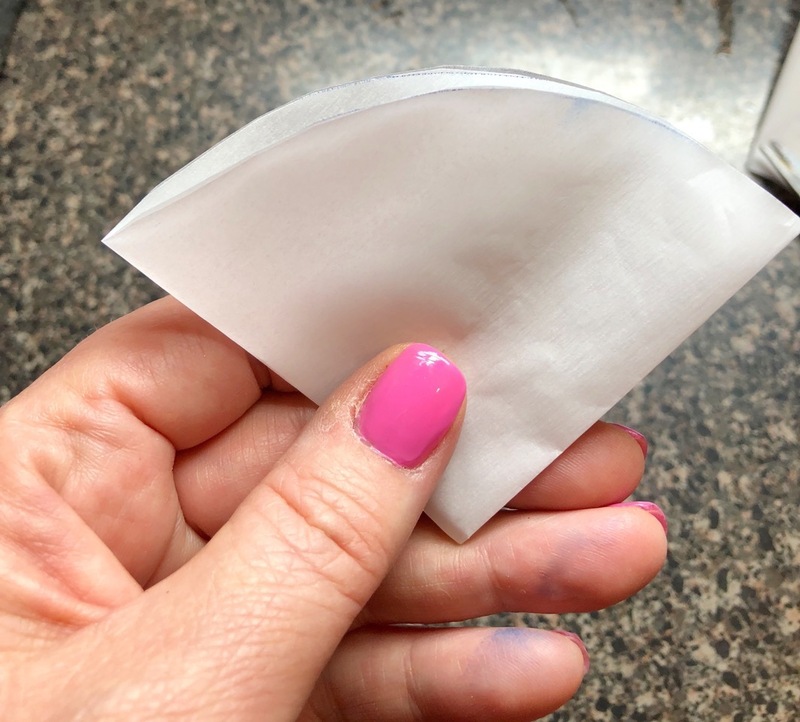 Quick tip on the parchment paper, place your pan in the center of a sheet of parchment. 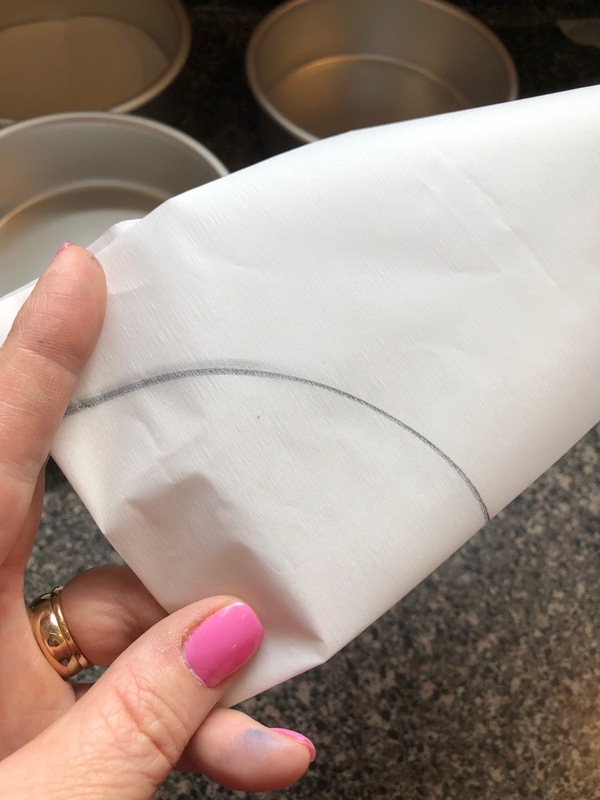 Trace the outline of the pan and then fold the circle in half and then in half again and then cut the outline of the quarter circle showing. Perfect fit every time. 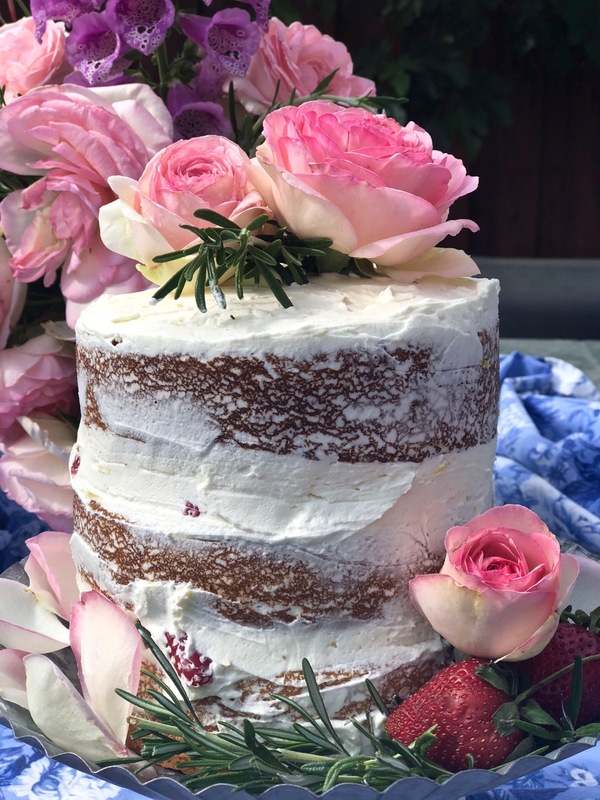 The funnest (I don’t think that’s a word but you know what I mean) part for me was “dressing” my naked cake with flowers and herbs from my garden. I was going to garnish with rose petals, but the dahlias have started blooming too … decisions, decisions. I love this time of the year in the garden and in the kitchen! Fruit of your choice optional. Preheat oven to 350°F. Zest two lemons and add to the olive oil so it can marinate while you prepare the batter. Squeeze the zested lemons to get ½ c. of juice. Grease three 6” x 2” round cake pans. Line with parchment rounds. Grease and lightly flour the parchment rounds. In a small bowl, whisk together the flour, salt, baking powder, and baking soda. In yet another small bowl, combine the lemon marinated olive oil, ½ c. fresh squeezed lemon juice and buttermilk. In a large bowl, beat the eggs and sugar on medium for about 5 minutes or until pale and thick ribbons form. Beat the vanilla into the egg-sugar mixture on low speed. With mixer still on low, add dry and wet ingredients in three additions, starting with the dry and ending with the wet. After the last addition turn the mixer off and whisk to combine. 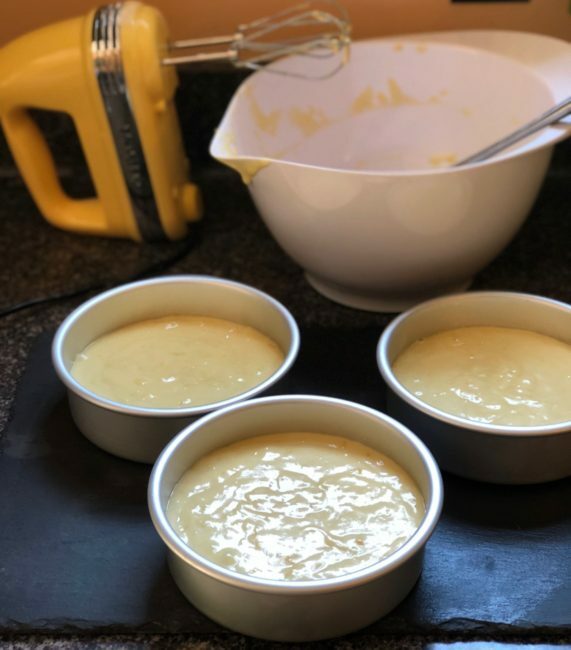 Divide the batter between the three prepared pans, filling each about half-way full. Try to get them as even as possible. When placed in the oven, be sure there is space between the pans so the air can circulate around them for even baking. Bake 20 to 25 minutes or until a toothpick inserted near the center comes out clean. Do not worry if they have not browned on the top. Remove from oven and cool in the pans on a wire rack for 10 minutes. Remove from the pans and continue to let cool on a wire rack. While your cakes cool, make the frosting. In a medium bowl, beat the mascarpone cheese and sugar until well combined. 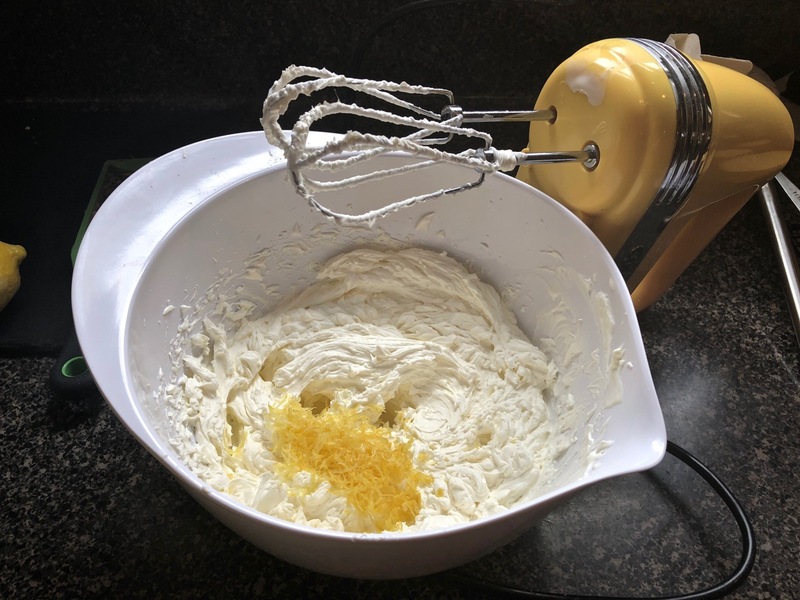 With the mixer running at medium speed, add the whipping cream and beat until the frosting becomes light and fluffy, about 3 minutes. Fold in the lemon zest. Refrigerate until ready to use. Once the cakes are completely cooled, they are ready to assemble, frost and decorate. 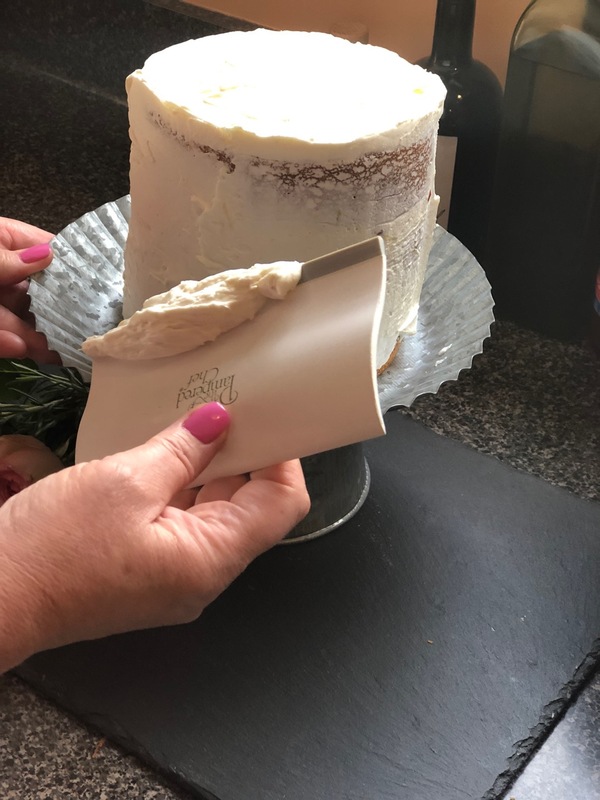 But first, if the tops of your cakes are rounded (hopefully not), gently cut just enough of the top off with a serrated knife so that they are level. With the top layer, turn it over, so the bottom of the cake (which is flatter and crumb free) is the top. Place one cake on your serving platter and frost with about 1/4 of your frosting. Do not spread it to the edges as it will spread more when you add the layers. 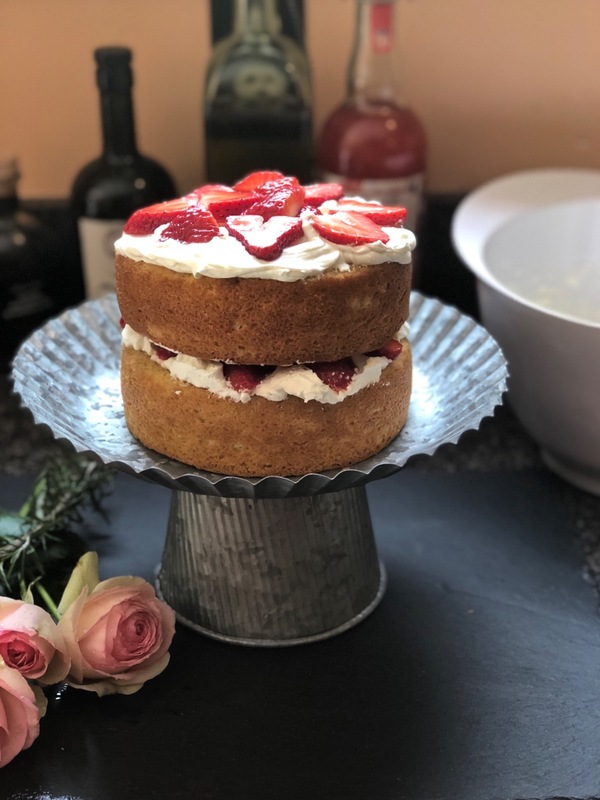 Add any fruit you may be using (I used Grand Marnier marinated strawberries for the cake below), again not too close to the edges as you don’t want it squishing out. Top with the next cake layer, press down lightly and repeat with frosting and fruit. 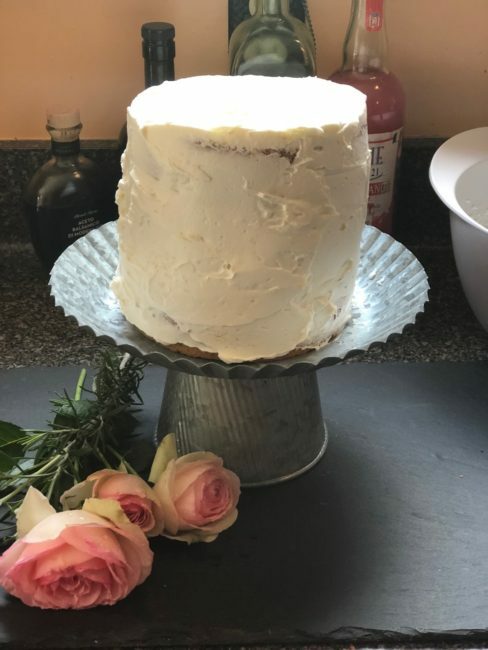 For the top layer, turn the cake over so the bottom of the cake is on top. 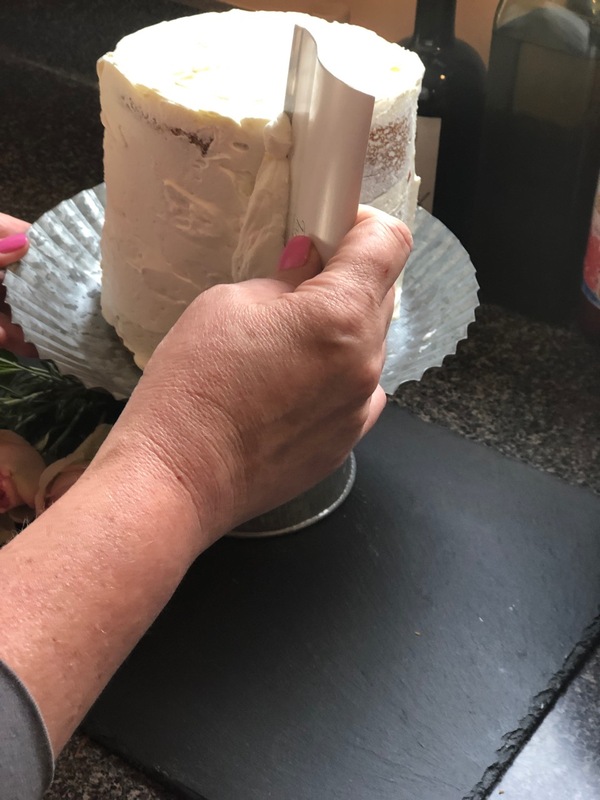 Press down on the other two layers gently to stick in place and also so that any fruit or frosting that squeezes out can be scraped off. Frost the top layer. 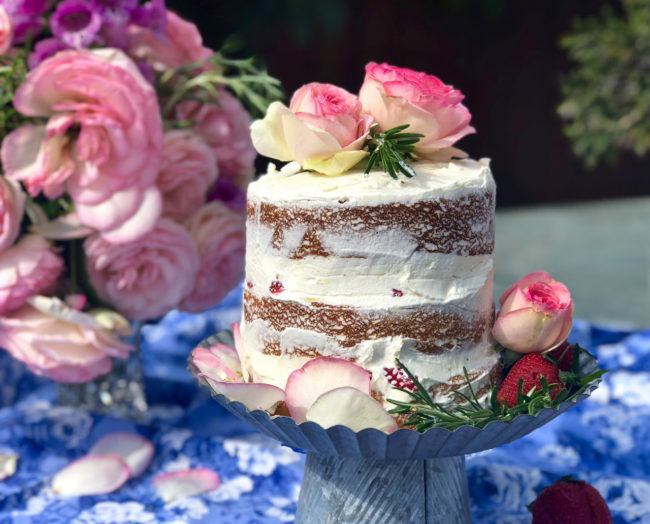 With your remaining frosting cover the sides of the cake as thin as possible and then use a bench scraper to scrape it off. Some people like the sides almost completely naked, I like a little bit of frosting on the sides. Now the fun part … decorate! Oh, and eat! Recipe adapted from Beth Kirby’s recipe for Lemon Olive Oil Cake with Lemon Cream featured in Better Homes and Gardens.